The Signal Trigger allows the triggering of an additional on-off function remotely using an existing R/C receiving system suitable for driving Servos, and a transmitter with a minor modification. The Signal Trigger connects to the signal used by one Servo (which may remain in operation using the same control channel) and detects the depression of a button or switch installed on the transmitter. This allows an additional on-off function to be triggered remotely without sacrificing a full R/C channel to the job. A 2 Amp relay is used to for the switching action, and may be connected similarly to a normal switch. This circuit completely eliminates the need for a physical servo operating a microswitch, and in the process allows functions to be triggered using the R/C system without the loss of any channels. Latching - Button is pressed once to turn on Relay, again to turn it off. Non-Latching - Relay is on when button pressed, otherwise off. Non-Latching, Minimum Trigger - As above, but triggered at minimum signal (0° rotation) rather than maximum (180° rotation). Good if you need near maximum positive trim set on the transmitter. Note that the Signal Trigger should only be used in "Non-Latching, Minimum Trigger" mode if full, or near full, positive trim must be used on the transmitter (for identification of positive/negative trim, see "Transmitter Modification" section, step 6). If this is the case, R4 must be replaced with a lower value (eg. 1K5) for use of this mode. The Signal Trigger takes its power from the servo power lead, however it may be connected directly to the battery if a large servo causes issues due to supply voltage drop. The Signal Trigger can operate on a supply voltage between 5V and 12V (technically it should work to 15V, but if running off batteries, a 15V supply would often actually be a higher voltage), most receivers and servos are designed to work at 6V and 7.2V. Remember, the relay allows you to switch whatever voltage you want (well under 220VDC or 250VAC anyway). The Signal Trigger, with the relay, consumes a bit under 70mA of current when the relay is turned on. When it is off, current consumption drops to around 4mA. If this is an issue, the output to the relay coil (pin one of the relay) can directly power a device from the 555 IC with 200mA current capacity, allowing the relay to be omitted and keeping the current consumption of the Signal Trigger at 4mA or less. However with relatively large loads, pulses may be present on the output in Non-Latching mode (see Circuit Description) unless a larger capacitor is fitted in place of C7. When power is applied, the Signal Trigger will initially come on in the "triggered" state. In Non-latching mode this will be momentary, while in Latching mode it will remain triggered until the transmitter button is depressed to disable it. To avoid resulting activation of a device in Latching mode, it may be desirable to connect a device to be turned on by the relay to pin one of the Relay connector (the normally closed side), such that when it is activated the device will turn off. Though if the device is often left off during use, this will mean that the relay is turned on and consuming current more often than necessary. 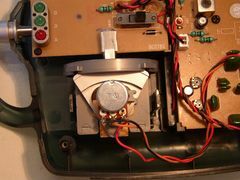 Where it is desired that the Servo Signal be cut to the Servo upon triggering in order to prevent movement when the trigger button is pressed on the transmitter (recommended), the Servo should be connected to "OUT 2". Otherwise, "OUT 1" should be the connection to the Servo lead. See "Compatibility" section for more information. The Square solder pad and boxed section on the silkscreen for the connectors indicates pin one. For the receiver and servo connections, this pin is for the signal wire (often yellow or white). Ensure these are correctly oriented. Pin 3 of the relay plug is connected to the middle pin (pin 2) when the relay is turned on (device is "triggered" by depression of the button on the transmitter). Pin 1 is connected to the middle pin when the relay is off. Five jumpers set the three modes available, as shown below. 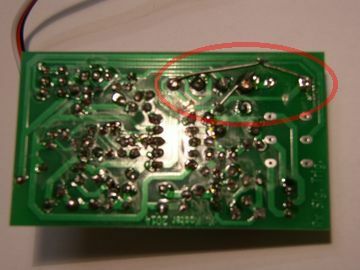 If you are building the kit, these connections could alternatively be directly soldered if there is no intention to use any other mode than that chosen (see "Parts" for components that may not need to be installed in this situation). 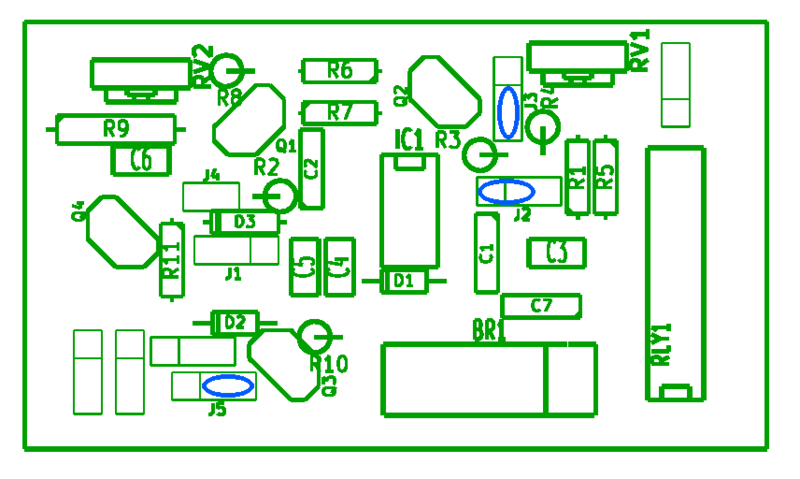 -Replace R4 with 1K5 or lower value resistor for this mode. For Latching mode, the Signal Trigger should be connected and turned on with both potentiometers rotated fully counter-clockwise. The Signal Trigger should turn on in the "triggered" or "on" state with the Relay energised. Now, with the trigger button depressed, rotate VR1 (on the left, when facing the same side of the circuit board as the potentiometers) clockwise until the relay goes off and, as when setting, then rotate it just a bit further to be safe. Now, still holding the trigger button, rotate VR2 (on the right) until the relay turns on and begins to click from on to off at a regular period of about half a second (if it won't, VR1 may have been turned too far), again give it a little bit more and it's set. Now you can release the trigger button and it should stop, pressing momentarily again causing it to change state once. If the trigger button does not cause the Sig Trig to change state when the control stick is towards the minimum position (or at center position and trim is near the minimum position), both trimpots may need to be rotated further clockwise for desired operation. Once installed, the potentiometers on the Signal Trigger should be adjusted. In Non-Latching mode this involves turning VR2 (the one on the right, when facing the same side of the circuit board as the potentiometer) first fully anti-clockwise (this may be done with a small screwdriver). Next turn on the Signal Trigger, receiver and transmitter and hold the trigger button on the transmitter while rotating the potentiometer slowly clockwise. When the Signal Trigger activates (noticeable by a click from the relay), turn just a little bit further to counter any drift in the circuit and remove the screwdriver. It is preferable not to turn too much further as this will bring the triggered range closer to the range of signal sent during normal operation with the trigger button released. VR1 does not need adjustment. Non-Latching, Minimum Trigger mode is calibrated as above, but with VR2 initially positioned fully Clockwise and rotated Anti-Clockwise with the trigger button depressed until the Relay switches on. You may wish to attach a device such as an LED to be switched by the Relay in order to better see the state of the Signal Trigger. 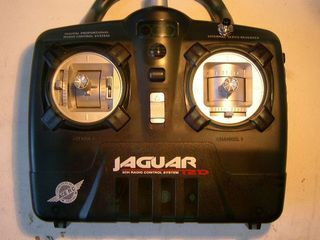 As a result of the wide range of R/C systems available, it is not possible to guarantee compatibility with all devices. However it is expected that most analogue R/C transmitters, receivers and servos, when used in combination, will work with the Signal Trigger. Digital Transmitters may require the limitation of control stick movement and compensation for this by adjustment of software settings (as described further in the "Transmitter Modification" section). Furthermore the action of some digital servos upon the cutting of the signal input is to rotate to their maximum position, while others hold their position at the point when the signal is cut (like analogue ones). Most Transmitters with mechanical trims should be compatible with this device. Digital trims (as fitted to many 2.4GHz transmitters) commonly use buttons or momentary switches to adjust trim, they are detectable by the fact that the trim adjustment is not left in a different position after setting. Some may also rely on electronic menus to adjust trim settings. However use of this device with digital transmitters (and their associated receivers) is likely possible by following the steps outlined for Digital Transmitters in the "Transmitter Modification" section. In most cases (especially where non-latching mode is used) it will be desirable to configure the signal to the servo to be cut when the Signal Trigger is triggered, preventing it from rotating to the full 180° position and instead remaining as previously. Due to the slight delay in cutting the servo signal after the trigger button is pressed on the transmitter, some servos may move some amount towards the 180° position before the signal is cut. This effect is more prevalent with "miniature" servos where no significant load is placed upon them. Many regularly sized servos will move little even with light loads. The behavior of most (if not all) analogue servos is to cease movement when the signal is cut, however many will not return to their location at the time of the signal being cut if they are rotated by another force. This may be an issue where a servo is under constant strain in a particular direction which it must actively turn against to maintain its position. As noted previously, different digital servos react in different ways to the cutting of their input signal. For example, a Hobby King HK-SCM8 6V Digital Servo (available from www.hobbyking.com) remains stationary after the signal is cut and, unlike most analogue servos, acts against rotation of its shaft by an external force. However a Turnigy TSS-11MGB Digital Servo (also available from Hobby King) rotates to its full 180° position when the signal is cut. It is possible that this represents the behavior of these two servo brands, but testing of more models would be required to confirm this. The reaction of these to the signal being cut varies and as a result it is not recommended that you use one with the signal cut feature of the Signal Trigger unless testing is done before hand. Some stop when the signal is cut, others continue at the previous speed/direction (the desired action), while some behave quite erratically. 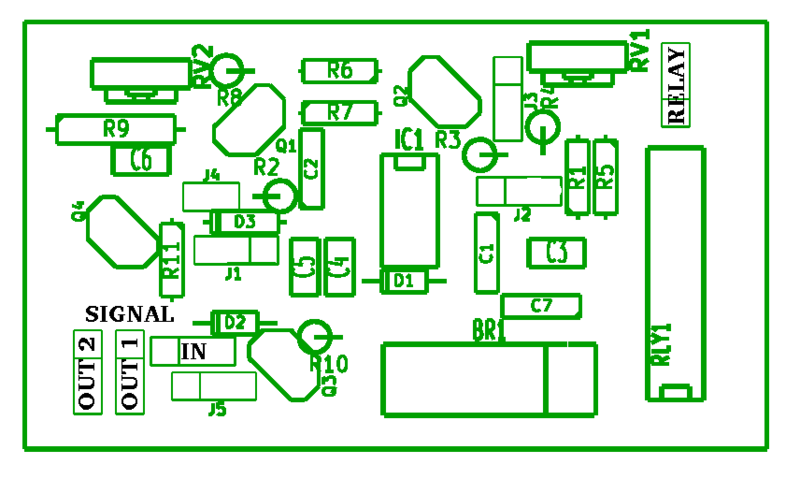 Following is a list of parts as included in the kit, components marked in bold are not required if the Signal Trigger is constructed for Latching mode only, while those underlined are not required if constructed for Non-Latching modes only. See below for notes on components with an asterisk. -Be sure to read this section if you are buying parts for this project. If you end up with another capacitor tolerance, I'm sure you can work out the general pattern. - These transistors must be of the "B" type (or "hFE Classification", technically speaking). Some component suppliers treat the classification suffix as interchangeable, but if you ask they might be able to provide you with the specific type. This doesn't apply to the BC54x/BC55x number (where x is 7, 8 or 9) as these correspond to voltage ratings and none will be over stressed in this circuit. - As you probably know by now, substitute a 1K5 resistor for R4 for use of "Non-Latching, Minimum Trigger" mode. -If operation of the circuit with a supply voltage greater than 12V is desired, these should be 1/4W types (as supplied in kit). -This can be omitted if no more than 200mA current draw is required to be switched by the Signal Trigger, with output instead taken from the Relay pin 1 connection. - This can be excluded if relay switching is not required and the output from the 555 IC is directly driving a device such as a small motor or set of LEDs. Note that 1ms pulses to ground will appear on the output in Non-Latching mode, the purpose of C7 is to filter these out for the relay. You shouldn't need any extra tools than those required for the transmitter modification described below. Be careful breaking the pin strips to make sure they break in the right spot. It's also probably easiest if these are the first things you solder onto the board as they might require some force to insert (use pliers to push all the pins at the same time). Unfortunately I messed up the PCB and put C7 on the wrong output of the Bridge Rectifier. If you're only building the circuit for use in Latching Mode, this isn't a problem as C7 isn't used (see "Parts"). However for use with the relay in Non-Latching Mode, the modification shown by the below pictures should be applied. Tracks with blue marks should be cut and wire links inserted as shown (this can be done after the relay is installed). C7 should be inserted with the ground side facing towards the relay. Make sure Diodes, transistors, the Bridge Rectifier and the NE555 IC go the right way around (as shown on silkscreen). The provided trimpots (VR1 and VR2) may need to have their middle pins bent forwards in order to fit into position with their adjustment side facing outwards. For making connections to the relay outputs, it would likely be best to simply solder the wires to whatever you want to switch onto the board or to another connector, rather than using a 3 pin connector waiting to be mistaken for a servo lead. If you want to run a high power servo that could draw over an Amp, the trace connecting the servo Ground (between pins 1 and 2 of J5) had to be pretty thin, so you will want to use a bit of wire to increase the current capability. When you're done, before connecting things up, it's best to use a multimeter to check at the receiver connection that positive isn't shorted to ground, that signal isn't shorted to positive, and that the resistance from signal to ground isn't significantly less than 39K (R9). If any of these are the case, check over your soldering to find any mistakes that may have caused the short. The solder-masked PCB included with the kit shouldn't be very susceptible to moisture, but sealed trimpots are provided so that if you wish to encase the Signal Trigger in potting compound (or some other convenient non-conductive sealant), it should be moisture-proof to an extent. These instructions apply to "aircraft style" transmitters, some steps may require modification to apply to "pistol grip" transmitters. 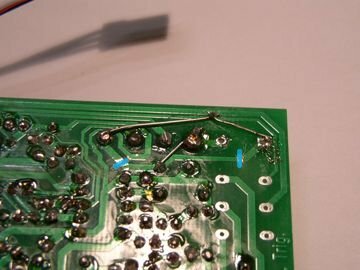 Modification to the transmitter requires only basic soldering abilities. 1st. Remove screws and take both halves of the transmitter's plastic shell apart, remember to remove the battery compartment cover to see any screws that may be placed inside. 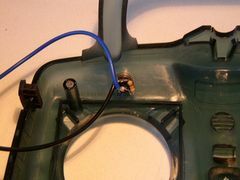 Wires running to the battery compartment may form an obstacle, the battery contacts may be removed from the back half of the shell, or wires may be long enough to allow work with the back shell placed adjacent to the control stick to be modified. The power switch cover and the crystal often also need to be pulled out before the shell can be parted. 2nd. Identify the control stick assembly to be modified and remove it from its position in the front shell (some transmitter designs may require the removal of further screws from the front face to allow this). If the potentiometer (described below) is easily accessible without removal of the control stick assembly, and installation of the button will not be obstructed by its presence, this step may be skipped. 3nd. Mount the push button in a suitable location inside the case. Find a spot where the depth of the button will not cause obstruction when the transmitter is reassembled, for mounting the switch included with the kit. A hole of 7mm diameter is required in the transmitter shell, for which a pilot hole of about 3mm will first be required. If another switch is used, ensure it is of the "Normally Closed" (often abbreviated as N/C) type, also known as "on - off" or "push off". 4th. Solder a 10K resistor across the pins of the push button switch, then cut the excess resistor leads. 5th. Identify the potentiometer as a metal can emerging from one side of the Control Stick Assembly. Emerging below the can should be three contacts with wires attached, running to the transmitter circuitry. 6th. Desolder the Black wire (or Red, if channel reversal it set on the transmitter) on the potentiometer and connect it to the push button via a new length of wire running to one of the button's contacts (heat shrink tubing, or another insulator should be applied to the join to prevent it shorting). Note that some transmitters (such as Spektrum types) may have a plastic coating over the potentiometer contacts that will need to be removed. Run a second length of wire from the other contact on the push button to the desoldered contact on the potentiometer. Some transmitters may use non-standard wire colours going to the potentiometer and in this case the wire closest in the direction of movement by the control stick to instruct 0° rotation to a servo is that required to be disconnected. Differentiation between the 0° and 180° positions for the above check can be difficult. It has been seen that some Futaba servos rotate Counter-Clockwise towards 180°, while Hi-Tec servos seem to rotate Clockwise. This may not be reliable over a wide range of models. Another way to test may be to use an Electronic Speed control, where the 180° signal should cause full speed forward rotation, however some systems rely on user setting for this function. If left in doubt, one sure way to test is to disconnect one wire going to the potentiometer other than the middle one and observe whether the Signal Trigger reacts as if the button is held (this is easiest using non-latching mode, VR2 can be set to minimum to ensure triggering), the wire that does this should go to the button. 7th. Check that the new wire connection on the potentiometer is not shorting to the middle pin, then reassemble the transmitter. As noted in the "Compatibility" section, some transmitters use Digital Trims which prevents the modification from working fully (see "Theory of Operation" for details). Therefore a mechanical limit may need to be placed on the travel of the control stick to prevent false triggering, particularly in Latching mode. This may be placed in the form of a piece of plastic preventing movement of the control stick to its full extent in one direction. This could take the form of a disc inserted into the control stick recess with a suitable hole cut out to allow full movement in every direction but that at which the trigger is activated, or a piece of plastic etc. could simply be glued over the end where the restriction needs to be placed. To compensate for the loss of travel, it is possible with many digital transmitters to extend the total range of motion available beyond 100% in a particular direction, thereby allowing the newly limited "maximum travel" position to be adjusted to the same equivalent servo or ESC position as in the original "maximum travel" position. With some Spektrum transmitters such as the DX6i, this function may be seen in the "TRAVEL ADJ" menu where travel may be extended to 125% in a particular direction. R/C Receivers control servos and ESCs using a Pulse Width Modulated (or PWM) control signal. This means that they tell them how far to turn or how fast to go by varying the duration of time that an electronic pulse is sent (the Pulse Width). These pulses are commonly sent at a frequency of 50Hz, though sometimes 40Hz is also used, as such every 20ms (1s/50Hz = 0.02s) a positive pulse is sent. With the control stick and trim at their middle position on the transmitter, this pulse should be approximately 1ms in length, when you move the control stick or trim on a transmitter this pulse length will change. From the perspective of a servo, the instruction to move to a position between 90° and 180° will be given as a pulse between 1ms and 2ms in length, while the instruction to move between 90° and 0° will be given with a pulse between 1ms and about 0.25ms in length. In analogue transmitters the trim function is provided by a mechanical bias on the control stick's rotation of the potentiometer inside the control stick assembly. As the potentiometer turns to produce a signal read by the transmitter to determine the position of the control stick, when trim is set below maximum, a full movement of the control stick does not result in full rotation of the potentiometer. Therfore a signal less than that for maximum rotation (about 2ms in length) is sent to a servo by the receiver. As a result, where the trim is set below maximum rotation, there is some "dead space" in the range of signals that are sent which is never used during normal operation. The Signal Trigger takes advantage of this "dead space". By disconnecting the Ground connection to the potentiometer (or the Supply Voltage connection, if the channel is set as reversed on the transmitter), the transmitter circuitry determines that the potentiometer is at its maximum position (max. trim and max. control stick) and therefore tells the receiver to send a full 2ms pulse to the servo. The Signal Trigger reacts to this long pulse by turning on the Relay and may optionally disconnect the signal connection to the servo to prevent it from reacting itself (the delay imposed by the relay may allow some servo movement, depending on the load on the servo). See the Circuit Description for a more detailed look at how the circuit works. Many digital transmitters do not use a mechanical trim, instead determining the extent of servo movement using software. As a result there is little or no "dead space" at the end range of the potentiometer, is it is read over pretty much its full rotation. As a substitute, a mechanical limit must be installed (as described in the "Transmitter Modification" section), and preferably, the range of travel extended in software to compensate. The output of the Signal Trigger is normally through a relay, though the connection to pin one of the relay may also be used as an output with 200mA current capacity. However with relatively large loads, pulses may be present on the output in Non-Latching mode (see Circuit Description). The provided relay has a maximum switching current of 2A and a maximum voltage of 220VDC. It is a DPDT type, one pole configured to allow switching off the servo signal while to other is provided as three connections for any other use (in place of a switch). If it is desired to use the signal switching pole for another purpose, connections can simply be soldered to the corresponding pins of the relay, however unless the relay is connected off the PCB, the long trace running from its third pin along the bottom side of the board should be cut (this connects it to the servo signal).